In a large sauce pan, bring the water to a boil. Add the oats. Immediately reduce heat to medium. Cook for one minute - stirring often. Remove from heat. 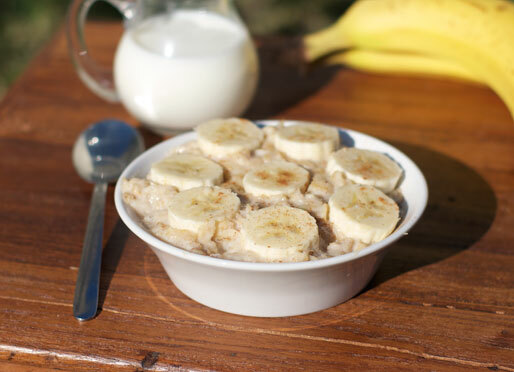 Add the banana slices and condensed milk to the oats and stir to mix. Cover the pan and let it set for 2 or 3 minutes, or until desired thickness is reached. Serve warm, sprinkled with cinnamon. Top with chopped walnuts or pecans and a splash of cold milk for a nice final touch. Thanks to "Britney" for submitting this recipe. I tried it and I loved it with a couple slight modifications. I used 3 banana. I mashed 2 of them and stirred them into the oats. I sliced the other into coins and served those on top. I found 1/2 cup condensed milk to be a little too sweet, so I took that down to 1/3 cup. For more about my version and to see more pics, visit my blog post called This Oatmeal Tastes Like Banana Cream Pie! My kids love this. They ask for it just as much as they do store-bought cereals. I hope you like it too. Recipe number 2025. Submitted 4/25/2007.